What is the volume of a pyramid with a height of and a square base with a side length of ? Find the volume of the following pyramid. Round the answer to the nearest integer. where is the width of the base, is the length of the base, and is the height of the pyramid. Find the volume of the following pyramid. What is the sum of the number of vertices, edges, and faces of a square pyramid? A square pyramid has one square base and four triangular sides. Vertices (where two or more edges come together): 5. There are four vertices on the base (one at each corner of the square) and a fifth at the top of the pyramid. Edges (where two faces come together): 8. There are four edges on the base (one along each side) and four more along the sides of the triangular faces extending from the corners of the base to the top vertex. Faces (planar surfaces): 5. The base is one face, and there are four triangular faces that form the top of the pyramid. An architect wants to make a square pyramid and fill it with 12,000 cubic feet of sand. If the base of the pyramid is 30 feet on each side, how tall does he need to make it? The volume of a 6-foot-tall square pyramid is 8 cubic feet. How long are the sides of the base? Area of the base is . Therefore, each side is . What is the surface are of a pyramid with a square base length of 15 and a slant height (the height from the midpoint of one of the side lengths to the top of the pyramid) of 12? To find the surface area of a pyramid we must add the areas of all five of the shapes creating the pyramid together. We have four triangles that all have the same area and a square that supports the pyramid. The area of the square is . 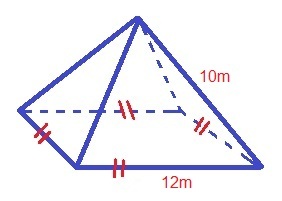 The area of each triangle is . We then multiply the area of each triangle by 4 to find the area of all four triangles . The four triangles have a surface area of . We add the surface area of the four triangles with the area of the square to get the answer for the surface area of the pyramid which is . Find the surface area of the following pyramid. What is the surface area of a square pyramid with a base side equal to 4 and a slant length equal to 6?